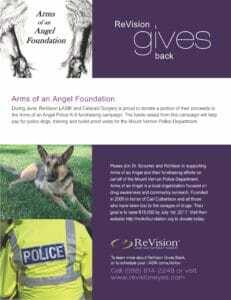 During June, ReVision LASIK and Cataract Surgery is proud to donate a portion of their proceeds to the Arms of an Angel Police K-9 fundraising campaign. The funds raised from this campaign will help provide a police K-9 unit for the Mount Vernon Police Department. Arms of an Angel is a local organization focused on drug awareness and community outreach. Their goal is to raise $18,000 by July 1st. Join Dr. Schumer and ReVision in supporting this fundraiser visit http://mvkcfoundation.org to donate today. Please note to help this organization meet its goal we extended our support by renaming them our ReVision Gives Back recipient for July 2017.